FertilityIQ: What Is Mosaicism And Why Should I Care? So far we’ve covered embryos that are either normal (euploid) or abnormal (aneuploid), and now we introduce “mosaic” embryos as a third category. Essentially, mosaic embryos have some cells that are euploid, and some cells that are aneuploid. Here’s why mosaicism matters. Mosaic embryos are less likely to work than euploid embryos but more likely to work than aneuploid embryos. When we lump mosaic embryos in with euploid embryos we risk prioritizing them over truly euploid embryos that are more likely to work. When we lump mosaic embryos in with aneuploid embryos, we ignore or discard embryos that may still lead a live birth. 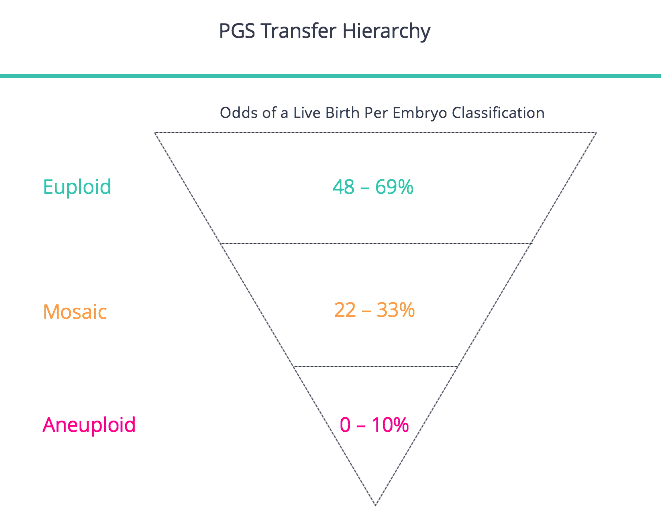 It’s also important to understand as the concept behind the biggest concerns around PGS’s accuracy, because it’s possible for mosaicism to lead to the misdiagnosis of embryos. When an embryo reaches blastocyst stage, when it can be biopsied for PGS, it has 50 - 300 cells. There are three possible scenarios for that embryo: all of its cells will be normal, all will be abnormal, or some combination thereof, and that’s mosaicism. Our hope is that the 5 - 10 cells that we biopsy (and from which we make our judgement) represent the whole embryo. Imagine your embryos are like three types of soccer balls: one is all white, one is all black, and one is a mix of black and white. If you take a sample from any of them, you’re hoping that it will represent the makeup of the rest of the ball. In the case of the ball that is all white, or all black, when you take a sample of that ball, it represents the entirety. In the case of the two-toned soccer ball, you might happen to grab a portion that is all white, or all black, or a non-representative mix of the two, and falsely conclude the ball has a different make-up than it does. This is the uncertainty that mosaicism introduces into PGS: our biopsy of 5 - 10 cells may not represent the entire 50 - 300 cells in that embryo and lead us to a false conclusion about the embryo’s potential. To know the makeup of that embryo for sure, we’d have to test all of its cells, and that means destroying the embryo, making it unusable for transfer. Let’s add one more quick wrinkle. Imagine each soccer ball has an outer layer and an inner layer. It might be possible for the outside layer to be all white, but the inside layer to be a combination all black, or black and white. This might make you question even more whether the portion you grab from the outside layer represents the ball’s entirety. This analogy extends to embryos, where there is an outer layer (trophectoderm, the eventual placenta) and an inner layer (the inner cell mass, the eventual fetus). That inner layer ultimately becomes the fetus and clearly interests us, but we are unable to test its cells, so we hope the sample we gather from the outer layer reflects the inner layer. Your likelihood of hearing about mosaicism, and whether it will impact your treatment, depends on the clinic you go to and the reference laboratory you choose. Some reference laboratories, (again, the lab that reads the sample), do not use a strong enough technology to read the biopsy and identify mosaicism. In this case, you will not hear about mosaicism. In other cases, the reference laboratory can detect mosaicism, but may have such a narrow definition of it, they almost never deem embryos to be mosaic. In this case, you’re highly unlikely to hear about mosaicism. Note: Here we should mention that what “counts” as mosaic differs in the field. A lot of reference laboratories have converged in the thinking that if an embryo is composed of anywhere between 20 - 80% of abnormal cells, it’s mosaic. Some laboratories are looser with their definitions and believe if 10 - 90% of the cells are abnormal, the embryo is mosaic. In other cases, the laboratory can detect mosaicism and defines it liberally, but the clinic does not want you to know if your embryos are mosaic, likely because they feel these embryos are no better than aneuploid embryos and they do not want to transfer them. We believe 50% of U.S. clinics purposely ask the reference laboratory not to report if any embryos are mosaic. Instead, many are classified as aneuploid and the patient is led to believe their embryos are of worse quality than they in fact are. Finally, even when laboratories can detect mosaicism, and clinics transmit the message to patients, we see a wide range of mosaicism depending on the clinic the patient was treated. 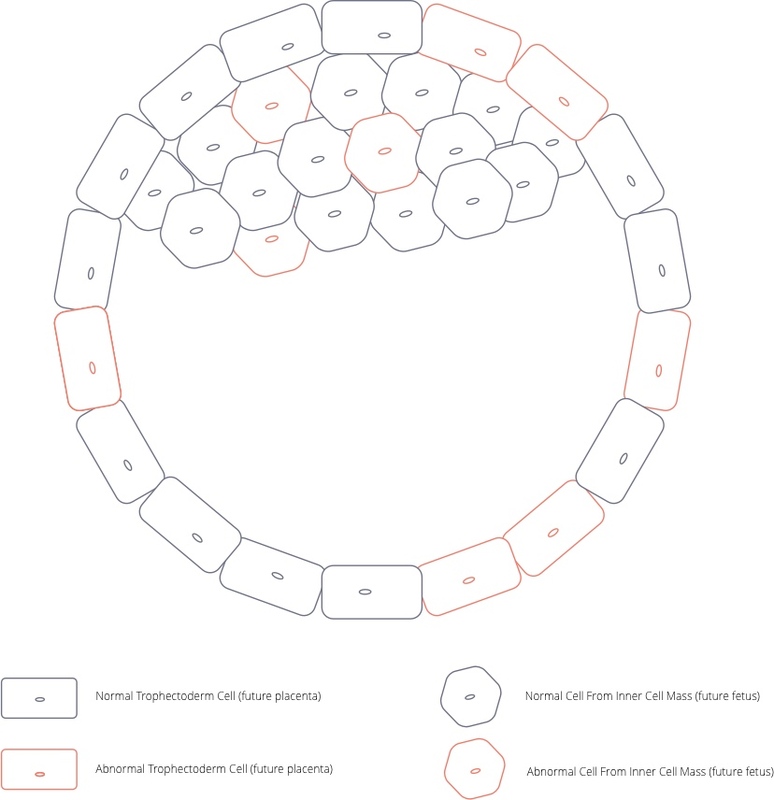 One reference laboratory that serves many clinics noticed amongst similar patients the embryo mosaicism rate ranged from 17% to 48%, depending on the clinic that sent the sample. There may well be things related to the drugs your clinic puts you on, or how your embryos are grown, that influences the probability your embryos will be labeled as mosaic. Above we showed a range for how often a laboratory or clinic is likely to tell your embryos are mosaic. That is a very different than how often your embryos actually are mosaic. So what is the true rate of mosaicism amongst fertility patients? We do not know because that requires a study that inspects every cell of a large number of embryos. No such study has been done. By and large, embryos that are considered euploid have a higher rate of success (48 - 69%) than mosaic embryos (22 - 33%) and, if you have euploid embryos, you should transfer those first. We’ll delve further into the notion of selecting a mosaic embryo for transfer below as some caution is warranted here. Finally, if your embryos are deemed to be aneuploid, they are unlikely to lead to a live birth. The best study we can find on the subject found that in a single center, only 4% of the 99 aneuploid embryos that were transferred led to a live birth. Why don’t we have more data? Most clinics won’t let patients transfer aneuploid embryos. Not all mosaic embryos are the same and there might be some mosaic embryos that are more likely to lead healthy live birth than others. As to which embryos are more promising, there is disagreement. As you can see below, two published papers recorded real differences about which mosaic embryos performed better. Similarly, there may be types of mosaic embryos that are more likely to be problematic depending on the nature of their chromosomal abnormality. For this reason, it’s crucial you consult a genetic counselor before contemplating the transfer of a mosaic embryo. One of the biggest questions patients have is whether transferring mosaic embryos is safe. We have seen a handful of studies that look at the outcomes of transferring mosaic embryos and none report long term issues. That said, only a few bothered to track those issues. Again, if you are considering transferring a mosaic embryo, contact at genetic counselor. Finally, most doctors will suggest that you have an amniocentesis (not a CVS) for prenatal diagnosis if you have a pregnancy resulting from a mosaic embryo transfer. Whereas CVS samples cells from the placenta, the amniocentesis samples cells from the fetus. That said, credible clinicians worry that even an amniocentesis isn’t foolproof, and if the results come back with some level of mosaicism they won’t truly predict whether the child will develop a mosaic-oriented disorder. Many doctors studying the issue have told us they have yet to hear of any child developing long-term issues having been born from knowingly-mosaic embryos. Ensure your clinic and laboratory characterize for you why your embryos are mosaic: the percentage of abnormal cells, are errors “segmental” or “whole chromosome” etc.